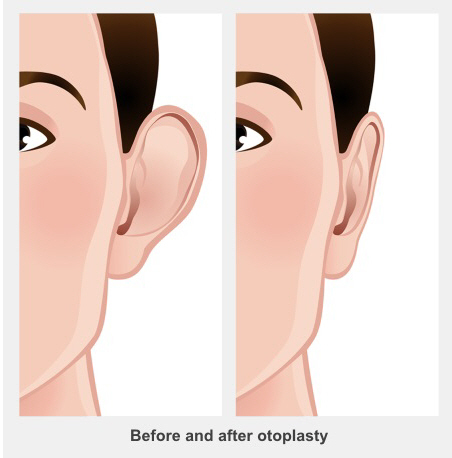 Otoplasty, also called prominent ear correction, is a cosmetic operation to correct ears that stick out. It can help when someone is self-conscious about the shape or size of their ears, has been teased about their ears, or has ears of different shapes. The aim of the surgery is to help the person feel more comfortable with how their ears look. Children and adults can have surgery for prominent ears, but children need to wait until they're about 5 years old. If a baby is born with prominent or folded ears, their ears can be reshaped into a more normal shape with splinting. It needs to happen in the baby's first four weeks, as after this age the cartilage doesn't respond to splinting. Not all children with prominent ears need corrective surgery. If a child isn't concerned about their ears, or has a confident personality, they usually won't need surgery. They can also hide prominent ears behind a longer hairstyle. Adults don't often have surgery for prominent ears in the public health system. This surgery is done by a plastic surgeon or an ORL surgeon, also called an otolaryngologist (ot-o-lar-in-gol-o-gist). ORL surgeons used to be called ENT, or ear, nose, and throat, surgeons. You may choose to pay to see a private plastic surgeon or a private otolaryngologist. Your GP can refer you to the Christchurch Hospital Plastic Surgery Department or to the Department of Otolaryngology, Head and Neck Surgery to see if your child would benefit from this operation. The specialist will explain the surgery and anaesthesia, as well as how long it takes to recover, and things that can possibly go wrong. For children, the surgery is done under a general anaesthetic. Adults who have this operation tend to have a local anaesthetic, which numbs the area being operated on. Children and adults both go home on the day of surgery. If your child is having surgery, on the day of the operation you'll meet the surgeon and the anaesthetist. Your child and one parent will then go into the operating theatre, where you can stay until your child is asleep. You can then wait in the day surgery area during the operation. The surgery involves making a cut on the back of the ear, which exposes the cartilage under the skin. The cartilage can then be reshaped using cuts and stitches to hold the ear in the desired shape. The surgeon then closes the cut with stitches and covers the ears and scalp with a bandage. Occasionally problems develop after the surgery. These can include bleeding, wound infection, poor scarring, or an ear shape that isn't any better or that gets worse. More surgery might be the only way to fix these problems. But they're rare – most operations go to plan and give pleasing results that last. After surgery, both parents can join the child in the recovery room. When your child wakes up they'll be moved back to the day surgery area. Later they'll go home with a prescription for pain relief medicine, instructions for how to care for them, and a follow-up appointment. It's normal to be a bit uncomfortable after surgery, but pain relief medicines can control this. The bandage will be taken off at the first follow-up appointment, usually about a week after surgery. Until then, your child (or you, if you've had the operation) need to avoid doing anything that takes a lot of physical effort. Your child should stay away from school during this week. When the bandage comes off, the ears will still be a little bruised, swollen, and tender. It's best to avoid contact sports for the first month after surgery. There will always be scars on the back of the ear, but they usually heal well and are well hidden from view. If you or your child are unwell in the week after surgery (for example, the pain is getting worse, fever or chills develop, there is bleeding through the bandage or the bandage falls off), contact your GP immediately. Written by a Canterbury plastic surgeon. Adapted by HealthInfo clinical advisers. Endorsed by clinical director, Plastic Surgery, and clinical director, Otolaryngology, Head and Neck Surgery, Canterbury DHB. Last reviewed April 2018.